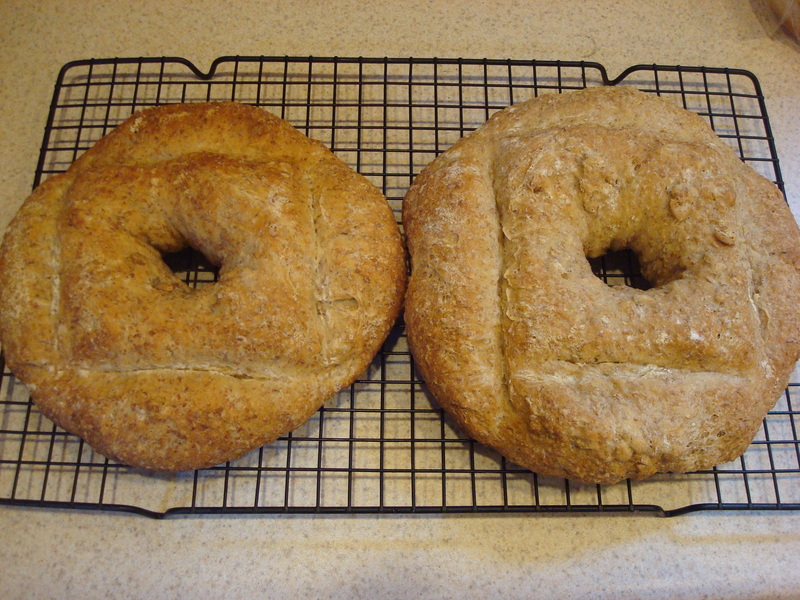 Unfortunately, in my last blog post, I miscounted the number of breads I had left. While I thought I had three, I actually had four. With the Sunflower Seed Rye under my belt, I NOW have three to go. The one I forgot about is Swedish Rye. Since I have the day off today, I thought it would be a great opportunity to bake another loaf, but when I read over the recipe last night, it turned out to be way more complex than I thought. It calls for things like dried orange peel (I already foresee problems procuring this item), anise, ground fennel, and cardamom. 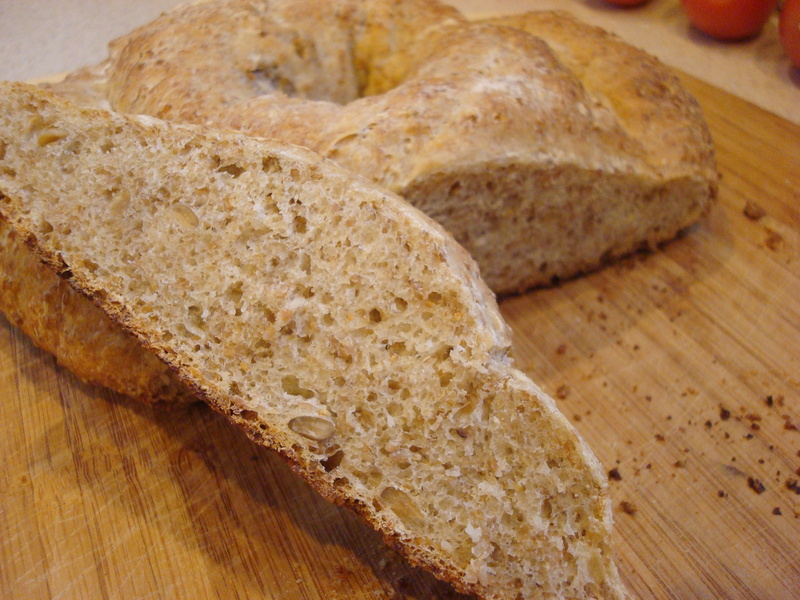 This bread sounds pretty aromatic and lovely, but definitely requires a trip to the store, which is why I’m sitting here today writing about it rather than baking it. Hopefully I’ll be able to get to it this weekend. Anyway, back to the bread at hand. To make the Sunflower Seed Rye, I made a firm starter (barm + flower + water) and a soaker (pumpernickel flour + water) the night before. 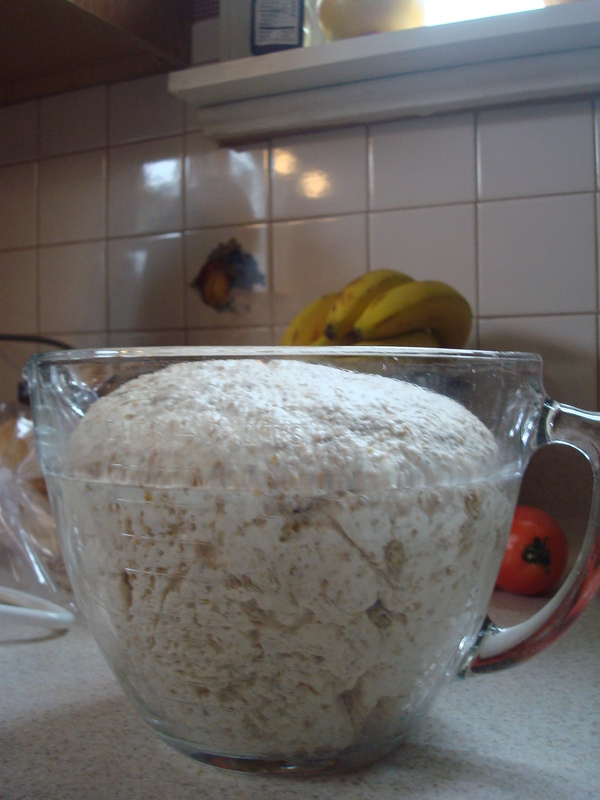 The next morning, I combined them with bread flour, salt, and instant yeast. 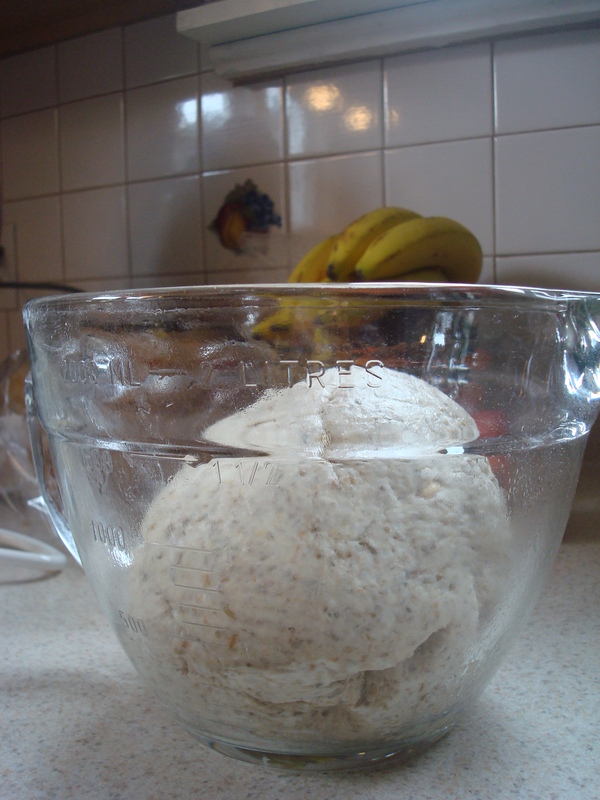 Once everything was incorporated, I kneaded some sunflower seeds into the dough and then let it rise for 90 minutes. 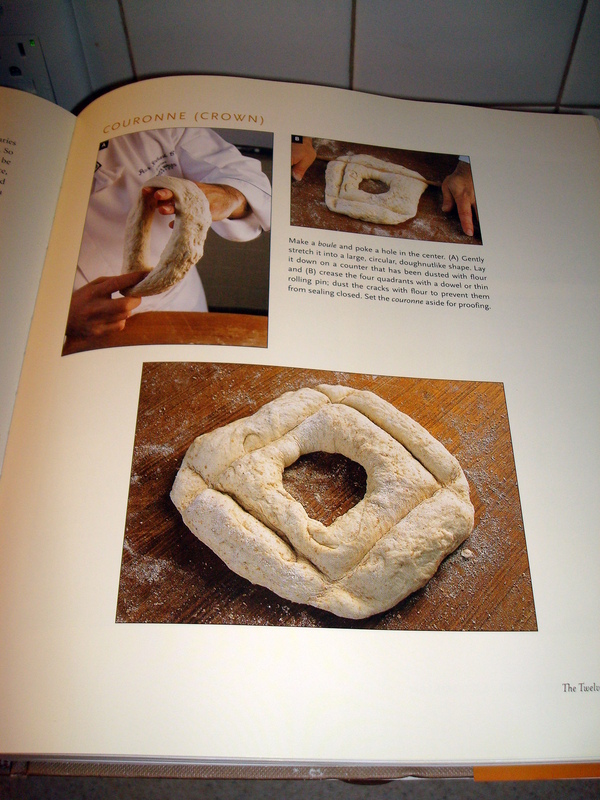 After the rise, I divided the dough and shaped them into “couronnes.” I always get a little nervous when trying out new shaping methods, but I thought my loaves came out pretty similar to the ones in the book. After letting them proof for another 90 minutes, they went into the oven. Here’s when I had a slight problem. 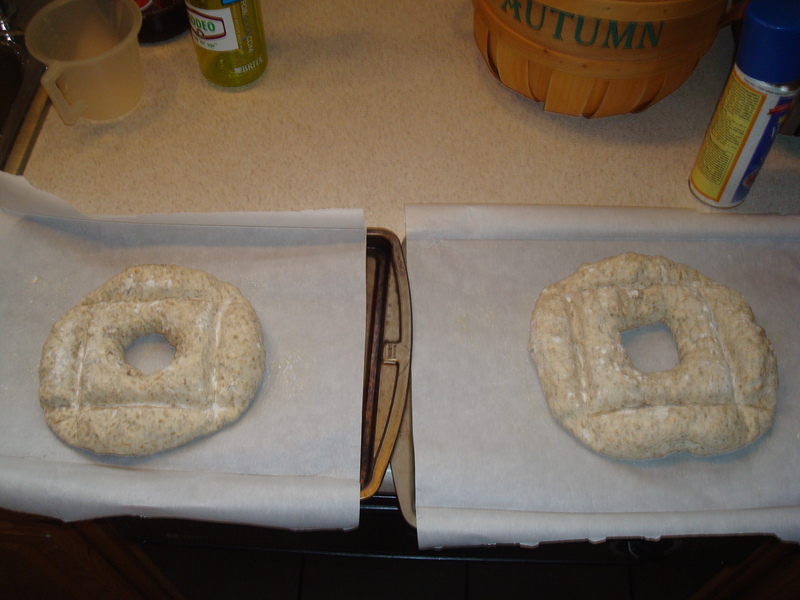 The book instructed me to let the loaves proof on parchment paper that had been sprayed with oil. When it came to the baking part, it said to bake them directly on the sheet pan. Why it would have me go to the trouble to have them proof on parchment paper and then slide them—potentially screwing up their shape—onto another pan? It didn’t seem logical to me, so I just left them on the parchment to bake. About 10 minutes in, Michael came into the kitchen and said, “Is something burning?” to which I replied, “Eh, it’s probably just something burning off of the oven.” A few minutes later, I noticed (thankfully I was alone at this point) that the kitchen seemed to be quickly filling with smoke. I opened the door to the oven, only to find smoke billowing out of it at an alarming rate. I pulled out the baking sheets to find the edges of the parchment paper black and smoldering. Luckily, there were no flames. I quickly disposed of the paper (while twice having to run to the doorway to fan the smoke detector, which kept going off) and slid the loaves back on to the pans. Lesson learned: do not oil parchment paper!! Luckily, the breads were only minimally harmed. Because I was in such a rush to get them back into the oven (and avoid burning down my house), I didn’t sprinkle corn meal on the pans like I usually do. I believe this was what caused the bottoms of the loaves to become very dark and crispy…but not quite burned. Phew! This bread tastes pretty good. It has a mild rye flavor and is nice and spongy. The sunflower seeds are a nice touch, and this is coming from a person who hates chunks of grain in bread. The shape of the loaf is a bit odd, so the bread can’t really be used for sandwiches. But, it’s still great toasted with PB & J…like so many breads that have come before it.